“I’m a Campfire Girl…I have to pay a visit to some old lady,” she told the nurse at the desk. This was a woman in a white uniform who looked as if she were cold; she had close-cut hair which stood up on the very top of her head exactly like a sea wave. Marian, the little girl, did not tell her that this visit would give her a minimum of only three points in her score. “Two what?” asked Marian without thinking. The sound like a sheep’s bleating almost made her turn around and run back. One old woman was pulling the door open in short, gradual jerks, and when she saw the nurse a strange smile forced her old face dangerously awry. Marian, suddenly propelled by the strong, impatient arm of the nurse, saw next the side-face of another woman, even older, who was lying flat in bed with a cap on and a counterpane drawn up to her chin. “Visitor,” said the nurse, and after one more shove she was off up the hall. Marian stood tongue-tied; both hands held the potted plant. The old woman, still with that terrible, square smile (which was a smile of welcome) stamped on her bony face, was waiting…Perhaps she said something. The old woman in bed said nothing at all, and she did not look around. Suddenly Marian saw a hand, quick as a bird claw, reach up in the air and pluck the white cap off her head. At the same time, another claw to match drew her all the way into the room, and the next moment the door closed behind her. “My, my, my,” said the old lady at her side. Marian stood enclosed by a bed, a washstand and a chair; the tiny room had altogether too much furniture. Everything smelled wet—even the bare floor. She held on to the back of the chair, which was wicker and felt soft and damp. Her heart beat more and more slowly, her hands got colder and colder, and she could not hear whether the old women were saying anything or not. She could not see them very clearly. How dark it was! The window shade was down, and the only door was shut. Marian looked at the ceiling…It was like being caught in a robbers’ cave, just before one was murdered. “Did you come to be our little girl for a while?” the first robber asked. Then something was snatched from Marian’s hand—the little potted plant. “Flowers!” screamed the old woman. She stood holding the pot in an undecided way. “Pretty flowers,” she added. Then the old woman in bed cleared her throat and spoke. “They are not pretty,” she said, still without looking around, but very distinctly. Marian suddenly pitched against the chair and sat down in it. Marian wished she had the little pot back for just a moment—she had forgotten to look at the plant herself before giving it away. What did it look like? To her surprise, Marian could not remember her name. “I’m a Campfire Girl,” she said finally. “Watch out for the germs,” said the old woman like a sheep, not addressing anyone. “One came out last month to see us,” said the first old woman. A sheep or a germ? wondered Marian dreamily, holding on to the chair. “Did not!” cried the other old woman. “Did so! Read to us out of the Bible and we enjoyed it!” screamed the first. “Who enjoyed it?” said the woman in bed. Her mouth was unexpectedly small and sorrowful, like a pet’s. “We all enjoyed it,” said Marian, without realizing that she had said a word. The first old woman had just finished putting the potted plant high, high up on top of the wardrobe, where it could hardly be seen from below. Marian wondered how she had ever succeeded in placing it there, how she could ever have reached so high. “I can’t stay but a minute—really I can’t,” said Marian suddenly. She looked down at the wet floor and thought that if she were sick in here they would have to let her go. With much to-do the first old woman sat down in a rocking chair—still another piece of furniture!—and began to rock. With the fingers of one hand she touched a very dirty cameo pin on her chest. “What do you do at school?” she asked. “I don’t know…” said Marian. She tried to think but she could not. “Oh, but the flowers are beautiful,” the old woman whispered. She seemed to rock faster and faster; Marian did not see how anyone could rock so fast. “Ugly,” said the woman in bed. “If we bring flowers—“ Marian began, then fell silent. She had almost said that if Campfire Girls brought flowers to the Old Ladies’ Home, the visit would count one extra point, and if they took a Bible with them on the bus and read it to the old ladies, it counted double. But the old woman had not listened, anyway; she was rocking and watching the other one, who watched back from the bed. “Poor Addie is ailing. She has to take medicine—see?” she said, pointing a horny finger at a row of bottles on the table, and rocking so high that her black comfort shoes lifted off the floor like a little child’s. “I am no more sick than you are,” said the woman in bed. “I just got more sense than you have, that’s all,” said the other old woman, nodding her head. “That’s only the contrary way she talks when you all come,” said the first old lady with sudden intimacy. She stopped the rocker with a neat pat of her feet and leaned toward Marian. Her hand reached over—it felt like a petunia leaf, clinging and just a little sticky. “Will you hush! Will you hush!” cried the other one. Marian leaned back rigidly in her chair. Marian saw the old woman’s eyes grow bright and turn toward her. This old woman was looking at her with despair and calculation in her face. Her small lips suddenly dropped apart, and exposed a half circle of false teeth with tan gums. Marian was trembling, and her heart nearly stopped beating altogether for a moment. “Now, now, Addie,” said the first old woman. “That’s not polite. Do you know what’s really the matter with old Addie today?” She, too, looked at Marian; one of her eyelids dropped low. “Why, she’s mad because it’s her birthday!” said the first old woman, beginning to rock again and giving a little crow as though she had answered her own riddle. “It is not, it is not!” screamed the old woman in bed. “It is not my birthday, no one knows when that is but myself, and will you please be quiet and say nothing more, or I’ll go straight out of my mind!” She turned her eyes toward Marian again, and presently she said in the soft, foggy voice, “When the worst comes to the worst, I ring this bell, and the nurse comes.” One of her hands was drawn out from under the patched counterpane—a thin little hand with enormous black freckles. With a finger which would not hold still she pointed to a little bell on the table among the bottles. “How old are you?” Marian breathed. Now she could see the old woman in bed very closely and plainly, and very abruptly, from all sides, as in dreams. She wondered about her—she wondered for a moment as though there was nothing else in the world to wonder about. It was the first time such a thing had happened to Marian. The old face on the pillow, where Marian was bending over it, slowly gathered and collapsed. Soft whimpers came out of the small open mouth. It was a sheep that she sounded like—a little lamb. Marian’s face drew very close, the yellow hair hung forward. “She’s crying!” She turned a bright, burning face up to the first old woman. “That’s Addie for you,” the old woman said spitefully. Marian jumped up and moved toward the door. For the second time, the claw almost touched her hair, but it was not quick enough. The little girl put her cap on. Marian never replied. She pushed the heavy door open into the cold air and ran down the steps. Under the prickly shrub she stooped and quickly, without being seen, retrieved a red apple she had hidden there. Her yellow hair under the white cap, her scarlet coat, her bare knees flashed in the sunlight as she ran to meet the big bus rocketing through the street. “Wait for me!” she shouted. As though at an imperial command, the bus ground to a stop. She jumped on and took a big bite out of the apple. 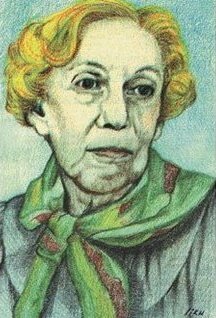 Posted in Uncategorized and tagged A Visit of Charity, Eudora Welty, short story, Southern fiction. Bookmark the permalink. w…what was…what was happening? What the heck man i was forced to read this short story about…I dunno. There was no identifiable plot nor lesson to be learned. How did this ever become considered a classic? Partly because of who wrote it. Also, it’s memorable for a number of reasons and is beautifully written. It paints a very vivid word picture. Your lack of understanding and inability to see the point does nothing to the story; all you’ve done is expose your ignorance, and lack of critical thinking. No need to be rude. It’s all in the way you see things. Typo: “I have to pay a visit to [sold] old lady”. Is it legal and ethical to copy the literary works from this site and give to students for study aids? It’s all right as long as original author is credited.